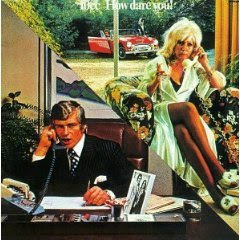 Everything 10cc had been doing had led to this masterpiece album. Four incredibly clever musicians and singers who seemingly could play every instrument, sing like angels and collaborate in endless combinations, 10cc already had their biggest American hit up to that time, "I'm Not In Love." While they were strictly a word-of-mouth cult act in the US, in the UK, they were unstoppable from the beginning. I remember WNEW-FM playing their early Beach Boys-paen "Rubber Bullets" a few years before How Dare You. One of my high school friends, Jesse Goldstein, was raving about the second album, Sheet Music, and explaining how funny the lyrics were. I was bowled over by the time The Original Soundtrack album came out, which contained "I'm Not In Love," one of the ultimate headphone records at the time. Intensely creative, crossing over all kinds of genres from opera to Italian movie themes, 10cc proceeded to up the ante with How Dare You (with the easily recognizable Hipgnosis-designed cover). They stepped into different characters from madmen to couch potatoes, threw in lots of bad puns ("I get a pain right here in the Shirley Temples! "), heavily overdubbed voices coming in and out of the speakers, all done in endlessly catchy pop melodies. 10cc specialized in stories of people not playing with all their cards intact. The album's pinnacle was "I'm Mandy Fly Me," a tongue-in-cheek airborne love saga of being smitten by an adorable airline stewardess in an ad and the wild fantasy adventure that ensues. On the album version, it begins with a snippet from the early "Clockwork Creep" song, with the words "Oh no, you'll never get me in one of these again/Cos what goes up, must come/Down, down, down, down." Graham Gouldman's bass cuts right in with Kevin Godley's 4/4 drums and away we go. Strummed piano strings, a beautiful whistling melody, the well-timed "Fasten Your Seatbelts" bell, and the tons and tons of overdubbed harmonies and vocals. Try me Mandy fly me away. And as my heart began to fall. Just like the girl in Dr. No No No No. I told them so but they said no no no no. Well I wouldn't be here at all. 10cc pioneered what I called the "pop opera" on their 1975 Original Soundtrack album -- the nine-minute "Une Nuit A Paris" actually came in three sections with many character parts. By the time of How Dare You, they compacted the form into four or five minutes. "I'm Mandy Fly Me" is wrapped up as a beautiful love song, performed with just a hint of "wink wink" and nowhere as bombastic as Queen's "Bohemian Rhapsody," but akin to the multi-part songs Paul McCartney liked to compose (worth noting that 10cc's Eric Stewart later joined McCartney's band). I know it sounds like a cliche but in the present era of unrelenting hip hop, sampling and second rate grunge rock bands, we will unfortunately never see the likes of a group like 10cc again. An act where everybody played real instruments, sang like nobody's business, and wrote unbelievably clever and memorable pop songs, with no Pro Tools, Auto Tune or digital editing to alter them. Yes, 10cc produced 4 top-notch albums and for me this and "Sheet Music" were the ones where I almost wore down the vinyl grooves in the 70s. My favourite track on How Dare You was the closer, Don't Hang Up, with its lost love theme and bouncy bridges, and beautiful singing (with the telephone voice from Kevin Godley’s wife Susan). where the technical background to "I am not in love".